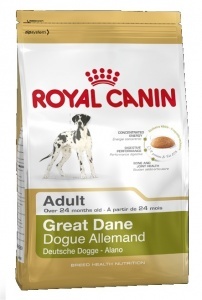 Royal Canin Great Dane for concentrated energy. 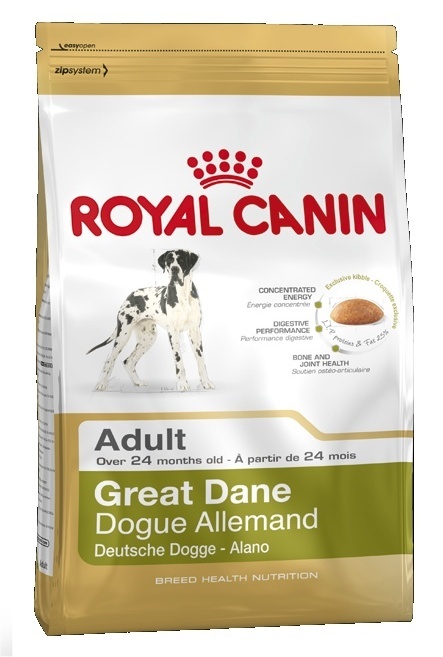 An exclusive high-energy kibble which covers the requirements of the Great Dane without overloading his stomach. Targeted digestive security thanks to highly digestible L.I.P. proteins and fibres which nourish the intestinal flora. Increased chondroitin, glucosamine, EPA and DHA content to help maintain mobility. Vitamins E and C taurine and polyphenols help maintain vitality and cardiac function in Great Danes. animal fats; tapioca; dehydrated poultry protein; vegetable protein isolate*; maize flour; rice; hydrolysed animal proteins; minerals; vegetable fibres; fish oil; beet pulp; yeasts; soya oil; hydrolysed yeast (source of mannooligo- saccharides); hydrolysed crustaceans (source of glucosamine); marigold extract (source of lutein); green tea extracts (source of polyphenols); hydrolysed cartilage (source of chondroitin). Protein: 23%; Fat content: 25%; Crude ash: 6.7%; Crude fibres: 2.4%; EPA and DHA fatty acids: 5 g/kg.